Ideally situated less than a mile from the Saskatoon International Airport, this hotel offers easy access to attractions such as the SaskTel Center, South Saskatchewan River, and Downtown Saskatoon. 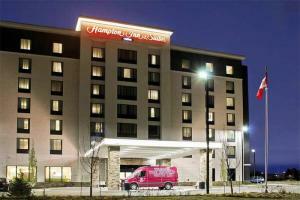 The contemporary guest rooms and suites feature stylish décor, WiFi, an HDTV, and a clean and fresh Hampton bed™. After a day of exploring the city, take a dip at the indoor swimming pool or relax at the hot tub. Enjoy complimentary shuttle service from YXE International Airport. Located right next to the Saskatoon Airport.